Remember the Cookies and Cream Fudge? Same idea, different cookies. This sounds fabulous. 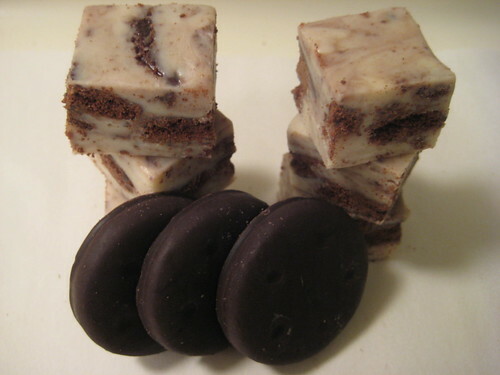 Man, fudge is good by itself, but adding thin mints, that just takes it to a whole new level. An amazing level, at that. Oh I could use a square of this right now! Mmmm. nothing like mint in fudge. I love peanut butter in it too, but mint it just perfect. I’m trying really hard not to buy any GSCs, but I wonder how well it would work with my leftover macaron shells. I can’t imagine that it would be bad! @Seanna Lea – I think macaron wold be too soft. The fudge is pretty thick, and you have to really stir it to get the cookies incorporated. But it sounds good! holy crap. this should be in every store. right now. These look deadly. I have some thin mints on hand – this would be a fun treat to take to work -thanks!